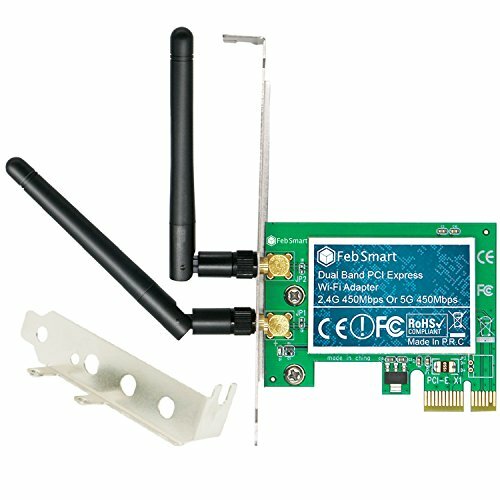 Feb Smart Wireless Dual Band N600(2.4GHz 300Mbps or 5GHz 300Mbps) PCI Express (PCIe) Wi-Fi Adapter Network Card With 6dBi External Detachable Antenna Special Designed for Online Gaming and Video Streaming. 1.Add Wireless Adapter on Desktop Computer-Say Goodbye to Wired Internet Cable, Move Your Desk top Computer to Anywhere You like. 2. Build inQualcomm AtherosChipset--Select Better Wi-Fi Solution Enjoy Better Wi-Fi Connection, Get Most of Wi-Fi Speed and Few Loss. 3. Engineered 2X3dBi Detachable External Antenna--External Antenna to Improve Wi-Fi Coverage and Performance. 4.2.4GHz and 5GHz Dual Band Concurrent 300Mbps- -Seamless connect to wireless 802.11 ac/a/b/g/n products, Share Fast and Stable Internet on 2.4GHz and 5GHz. 5. Comply with 64/128 WEP,WPA/WPA2,WPA-PSK/WPA2-PSK(TKIP/AES) Security Protocol--Ensure You Connect to Most of Wi-Fi Signals. 6. Low Profile and Standard Profile Bracket Inside--Both Mini and Standard Desktop Host Workable. Usage: Online Gaming and video Streaming on Desktop Computer. Need to Install driver on Windows7,XP,Windows Server(32/64bits). 1.The FS-N600 will add high speed 802.11 N Wi-Fi connectivity to a desktop computer through a PCI Express (PCIe 1X)slot . Allow desktop computer connect to wireless network at 2.4GHz 300Mbps or 5GHz 300Mbps. 2. Build in Qualcomm Atheros chipset. Engineered 6dBi detachable external antenna. Improve wireless network reliability and performance. Provide high speed Wi-Fi connection for online gaming and HD video streaming. 3. Seamless connect to wireless 802.11 ac/a/b/g/n device. Support 300Mbps max throughput on 2.4GHz band or 5GHz band. Comply with 64/128 WEP, WPA/WPA2,WPA-PSK/WPA2-PSK(TKIP/AES)security protocol. 4. Compatible with Windows10,Windows8.1,Wondows8,Windows7,Windows XP,Windows Server(32/64bits)Works with PCI express X1,X4,X8,X16 slot. Low profile and standard profile bracket inside works with both mini and standard size PCs. If you have any questions about this product by FebSmart, contact us by completing and submitting the form below. If you are looking for a specif part number, please include it with your message.